For the second year we’ve compiled what we have on the coin release schedules for many of the major national and private mints. Most don’t issue a programme unfortunately, but many European mints do. As with all our guides, we’ll keep this one fully updated and we’re already compiling some more to add to it pending further information. There’s plenty here to get started with. Just click the cross next to the schedule name you’re interested in at it will open up. Click another cross and that one will open and the previous one you were looking at will close. You may notice some coin names appear as links, click on these and you’ll see an early coin image if we have one. Some of the information is tentative and/or extrapolated from previous issues, and all dates are subject to change. As we said, a guide. Any corrections or further information you have is appreciated as we only have so much time to chase these up and it’s never enough. Hope it’s useful. AgAuNOTES: Many more coins this year, mainly due to a pottery series, but no gold (a pair are due in 2019). Instead, there are numerous circa-5oz silver issues, including one for the FIFA World Cup. The Hovhannes coin is rectangular and the pottery series is square. AgAuNOTES: Very little specification information at present, but we’ll update when we have more. 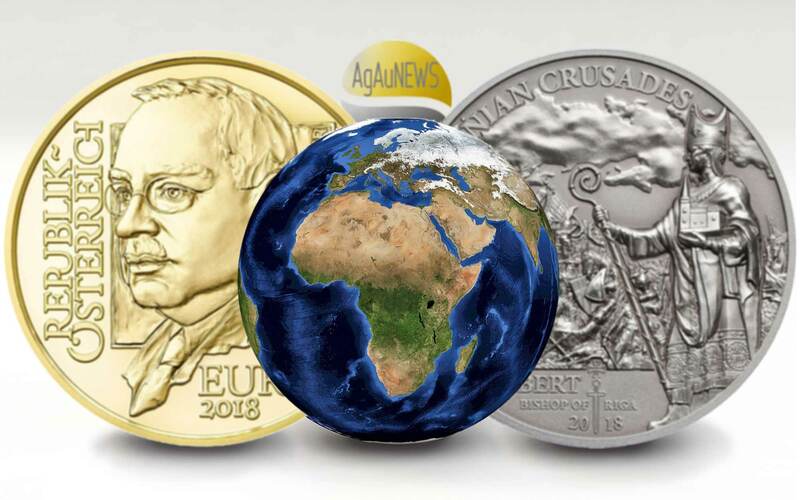 AgAuNOTES: As of January 1st 2018, the Royal Mint of Belgium has ceased producing commemorative coins and the task has passed to a private company. Details to follow. AgAuNOTES: The Gyorgy Hevesy coin is rectangular in format. The Hungary coin is said to be shaped like a map, a rare choice for a national mint. It will be the introductory piece to a series about the counties of Hungary. AgAUNOTES: More details in a couple of weeks. AgAuNOTES: It looks like the last two coins are carried over from the 2017 release schedule. We’ve yet to confirm coin weights. AgAuNOTES: The first four coins are quite unusual and will be well worth watching out for. The first is a standard gold coin, but the next three are steadily larger silver rings that fit around it to form one large four-part coin. Keep an eye on the newspages for more. AgAuNOTES: A rare gold coin coming in April. The Europa Star coins will feature the ‘Baptism of Christ’, a marble sculpture created by Giuseppe Mazzuoli (1641-1725). This massive work of art is found in St John’s Co-Cathedral and it is one of the foremost expressions of Baroque in Malta. AgAuNOTES: Just a single release in the outstanding Treasures of Stanislaw August series for the first time. AgAuNOTES: Almost double the number of issues in 2017, it’s a big year for the Slovak Republic and that’s reflected in the coin programme. AgAUNOTES: Should know more soon. AgAuNOTES: The last four coins are six-sided and sold in souvenir packaging. It’s great to see the Fauna in Ukrainian Cultural Monuments series continue as it’s quite superb. Not sure on the Digging up Potatoes coin, however….